We are halfway through January and mission eat healthier is going well! Every morning I eat a nutritious breakfast. My current favorite is baked oatmeal with fruit. Then I have a light but filling lunch during the day. After work I come home and make a balanced dinner for my family. It’s working for us and it’s making us feel better too! 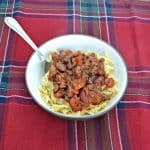 Since it’s been so cold outside I’ve been craving hot and delicious meals. However, I find that my favorite comfort foods are filled with fat and calories. 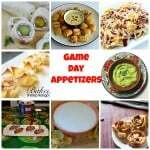 I’ve been trying my hand at lightening up some of my favorite recipes and so far it’s been a success. 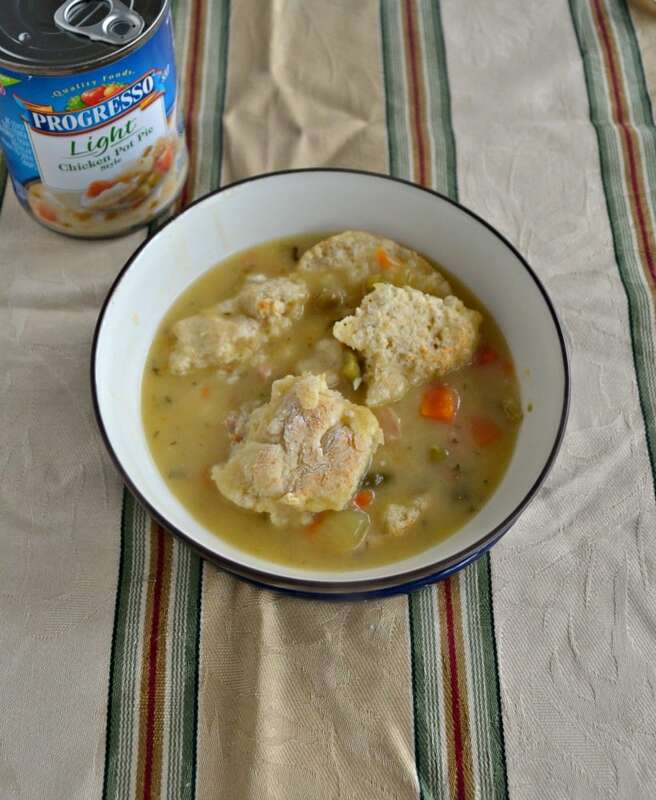 The main ingredient in my Healthier Chicken Pot Pie is Progresso® Light soups. 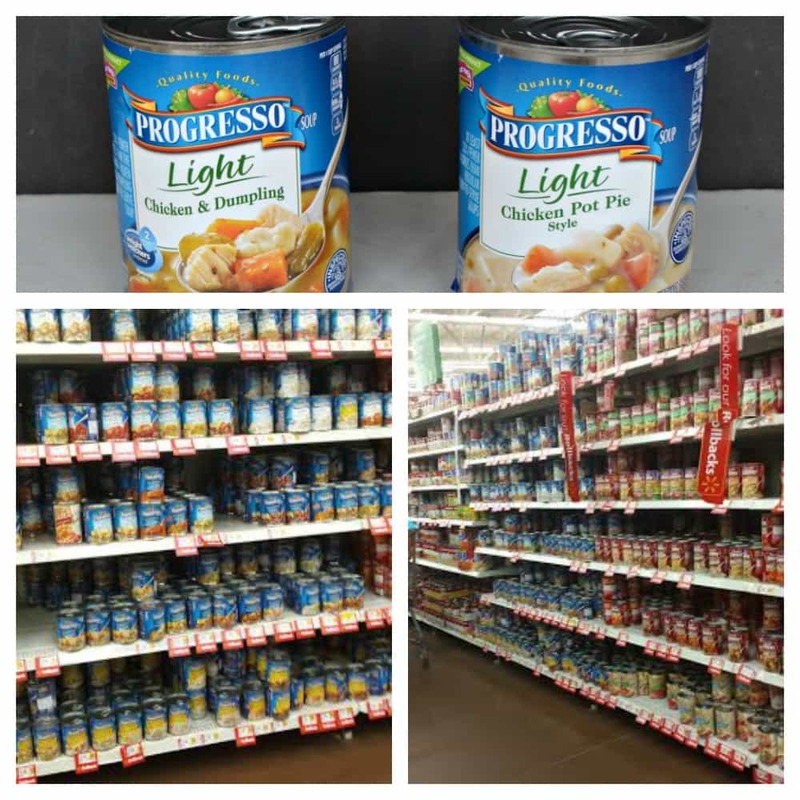 My local Walmart carries a large selection of Progresso® Light soups and I picked up 2 cans of Progresso® Light Chicken Pot Pie Soup and 2 cans of Progresso® Light Chicken and Dumpling. I bought four because you can $1.00 when you buy any FOUR cans of Progresso® soup using THIS coupon. Not to go off topic but whenever you buy Progresso® soups you receive Box Tops for Education. If you have a school aged child this program can help provide money to his or her school just from buying products you already buy at the grocery store. As a special education teacher I often don’t receive the same funding other teachers do and Box Tops for Education has provided me with funds for teaching materials, art supplies for my classroom, and rewards for my prize box. So not only do I get a healthy and delicious soup, I get money for my classroom as well! Back to my Healthier Chicken Pot Pie, I used simple ingredients to make this delicious comfort food. 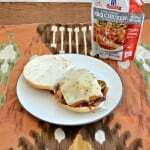 I started with two cans of Progresso® Light Chicken Pot Pie Soup and one can of Progresso® Light Chicken and Dumpling Soup. I simply poured the soup into a pie pan. Then I made a batch of my homemade biscuits, dropped them on top of the soup, and baked that along with a few other biscuits. That’s it! The dish smelled wonderful. It came out of the oven with the biscuits just beginning to brown on the top. 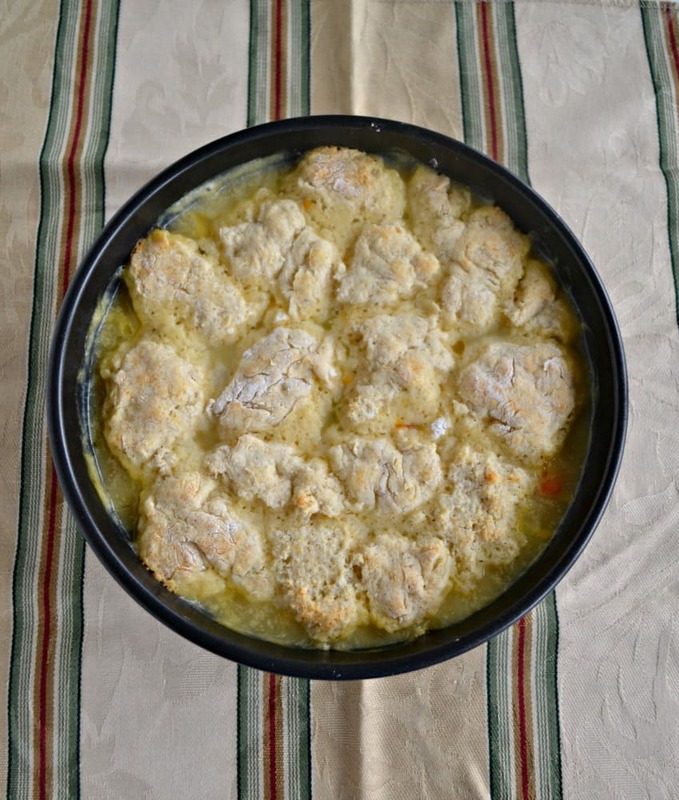 I split the extra biscuits in half, placed one at the bottom of a bowl, and spooned the Chicken Pot Pie on top of it. The filling was delicious and I love that it is light! The biscuit bottom and the drop biscuits on top gave me just enough crust to make it feel like I was indulging. 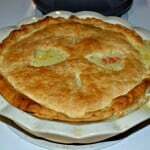 This is such tasty and healthier version of Chicken Pot Pie. 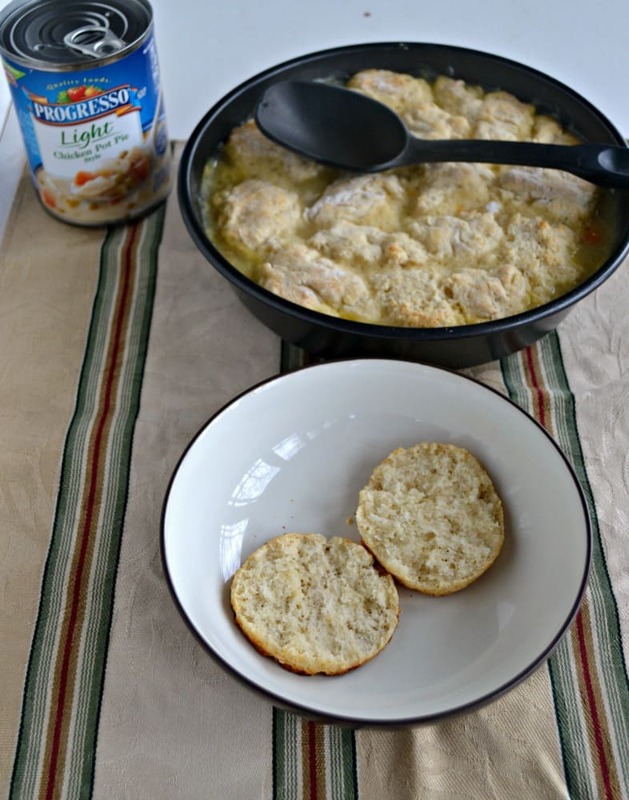 Make Chicken Pot Pie in minutes with Progresso® Light Soups and Homemade Biscuits! 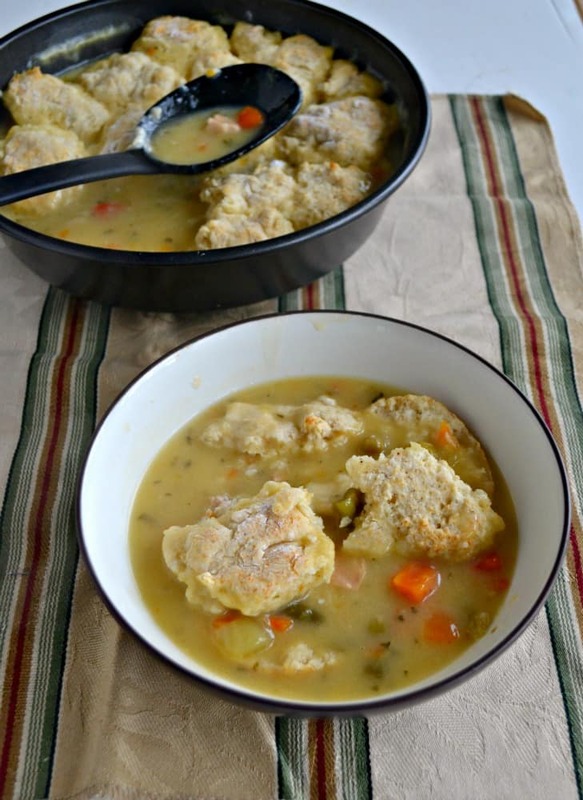 Pour the Chicken Pot Pie soups and the Chicken and Dumpling soup into a 10 inch round baking dish or a 9 x 9 baking pan. Set aside. In a small bowl combine the flour, baking powder, and salt. Cut the butter into small pieces and add to the flour mixture. Using your fingers, combine the butter with the flour until it resembles coarse sand. Add in the garlic, milk, honey, and Parmesan cheese. Mix well until a dough forms. Divide the dough into thirds. Take one third of the dough and roll in into 12 equal sized balls. Flatten the balls with your hands and drop on top of the soup in the pan. Place the pan in the oven and bake for 5 minutes. Continue baking everything for 12 minutes. Remove from the oven and place the biscuits on a cutting board. Cut each biscuit in half. Place both halves of the biscuit in the bottom of a bowl. Spoon one quarter of the pot pie mixture on top of the biscuits. Repeat with remaining 3 bowls and remaining biscuit halves. Serve hot. That looks really good. Thanks for sharing. Have a great week! you’re welcome! 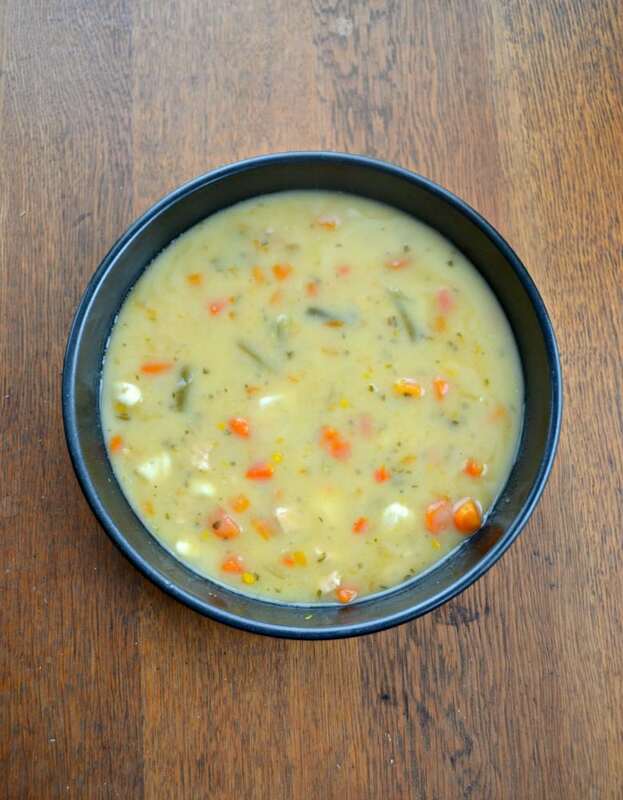 It’s such an easy recipe and it’s much healthier than traditional pot pie. Looks really yummy and a great way to warm up too. I cut those box tops off for my grand kid’s school. Such a simple way to help the schools.